Hi and welcome to the second edition of BETTER FUNDRAISER. The ezine from www.better-fundraising-ideas.com we hope you will find it interesting and useful. We hope you have had a great summer and that the fundraising activities you organised or took part in this year went well and raised lots of much needed cash. For me, my daughter started a new junior school so there was a new PTA to join and people to get to know. Its early days and it always takes a while to get to understand how different organisations work. I'm hoping however to pick up some new ideas, tips and inspiration. I know from the correspondence we receive via the website that all groups are different and even if the fundraisers are similar it is often the neat little twists different groups use that can make all the difference both to volunteer participation (fun) and the bottom line. If I pick up anything useful I will be sure to pass it on. The website continues to grow and we are now receiving 3000+ visitors nearly every day from all around the world. These visitors vary from experienced managers from larger groups down to junior fundraisers importantly telling the world about their own school sponsored silence - and quite right too! We also have been getting a lot of interest and email from people seeking to put on fundraising events for their companies or workplaces. Its nice to know that even in the face of recession people still want to participate in fundraising events and help other people - Maybe its even because of it. Politicians talk a lot of community and "Big Society". People getting involved with groups close to their own hearts and supporting the causes close to the hearts of others are the "action" part of that. - We're the ones who get on with it! Please enjoy the rest of this ezine and don't forget to share it and the link to the website with your friends. With very best wishes for your fundraising adventures! 2 new pages that have appeared on the website recently concern mission statements………I know what you are thinking! Having looked at a lot of charity mission statements from groups all around the world we definitely have one main conclusion - Less is more. The best ones were short and sweet and certainly did not try to use the flowery prose or business-speak so beloved of company PR departments. Better Fundraising Ideas is a free and friendly website full of great ideas and advice for amateur fundraising groups all around the world. Does your group have a good mission statement? We would love to include it on our pages. Send it in and we will feature it on our page of Sample Mission Statements . 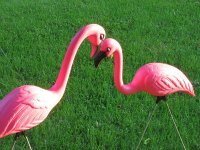 Another recent addition to the site was a page about Flamingo Flocking Virtually unknown in the UK this fun fundraiser certainly seems to be taking North America by storm. Waking up to find your garden full of pink plastic flamingos must really put a smile on people's faces even if there is a charity fee for removal. If this takes off in the UK I can certainly think of a few family and friends whom I may book a visitation upon! 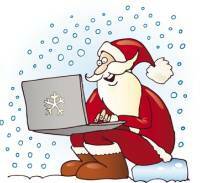 Also if you come across any Christmas related good ideas over the festive season however small or insignificant they may seem please do send them in to us. A few lines telling us about a neat idea or item to sell really can help other groups all around the world. This Bake Sale Favourite has an obvious Christmas feel to it. How easy it is (and how much fun) to take in a tray of mince pies to your office or workplace in the run up to the winter holidays. A tasty mince pie for a donation in your collecting jar - well worth the effort. It is the zest in the pastry that gives these mince pie marvels that little bit extra. 1.To make the pastry, rub the butter into the flour, then mix in the sugar and a pinch of salt along with the zest (and maybe a few drops of juice from the lemon / orange). Combine the pastry into a ball - and knead it briefly. The dough will be fairly firm, like shortbread dough. You can use the dough immediately but it is better for rolling if chilled for a while. 2.Preheat the oven to 200C/gas 6/fan 180C. 3.Roll out the pastry and cut out appropriately sized cases and lids for your pies. 4.Place the cases into a jam tart tin. Spoon the mincemeat into each of the pies - not too little but not too much or they bubble out whilst cooking..
5.Take the pastry lids and cover the pies pressing the edges gently together to seal - you don't need to seal them with milk or egg as they will stick on their own. (The pies may now be frozen for up to 1 month). 6.Brush the tops of the pies with the beaten egg. Bake for 20 minutes until golden. Leave to cool in the tin for 5 minutes, then remove to a wire rack. To serve, lightly dust with icing sugar. They will keep for 3 to 4 days in an airtight container. Do you have a bake sale favourite? Send the recipe in to us and we will try to include it either on the web site or in a future edition of Better Fundraiser. We really do love hearing about good little fundraising ideas and love to add the best to the site. Our site statistics show us that lots of our visitors enjoy reading these ideas sent in by readers too. So if you have a good fundraising idea either that you have seen somewhere or done yourself please send it in. Don't forget to include all the details of your idea. Lots of the people who visit our site are looking for ideas because they are "newbies" who suddenly find themselves on the fundraising committee of their school, church or local charity. They want all the details experienced "old hands" like yourselves can give them. Take Care and have a great Winter of Fundraising Fun.